Warehouse 23 Only! – click here to order! Have you seen the mark of Cthulhu? Now control . 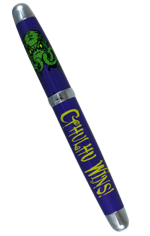 . . the marker of Cthulhu! 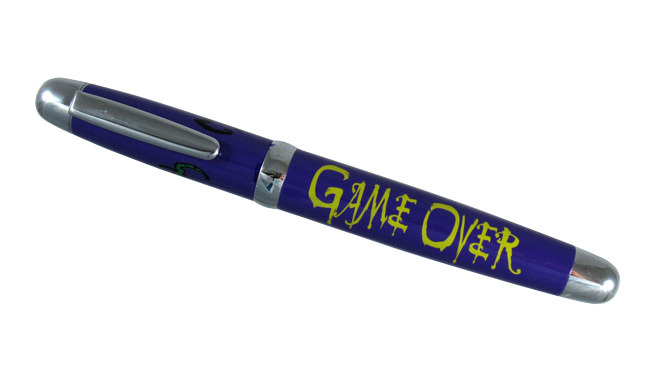 This solid metal case turns a regular disposable pen or marker into a designer writing tool. The Cthulhu Sherpa will last for YEARS. Unless you put it down and take your eyes off it. In that case, it will probably be gone in 60 seconds. It's that cool. It's purple. Very purple. It carries the image of Great Cthulhu and the "Game Over / Cthulhu Wins" slogan. 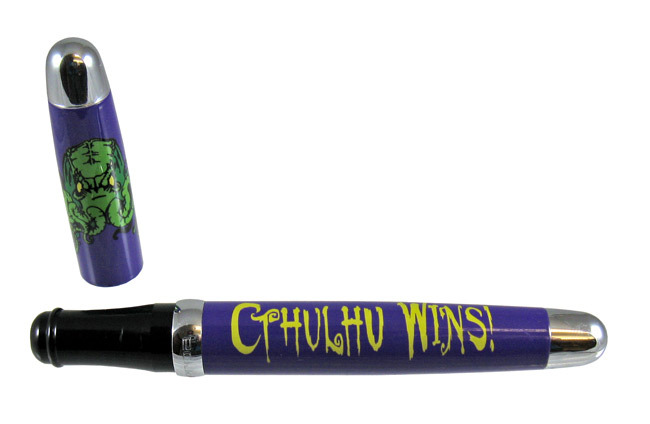 A perfect gift for the cultist in your life . . . or gloat over it yourself! The Cthulhu Sherpa is available in VERY limited quantities: We made 250, but some of those are reserved for staff, prizes, and so on. Because it's a bigger print run than the original Munchkin Sherpa, it costs only $40. It includes a purple marker. Get one now before they're gone! Sherpa is a trademark of the Paradise Pen Company.